i spent my late teens and early twenties in the new york city club scene. it was the era of places like club USA, limelight, twilo and others. a place where the worlds of fashion, art and finance would converge. where anyone could become whoever they wanted. and that someone could be someone different every night. in a way, it was like a living magazine. it was also a time when the after-hours scene was alive and well. i’m thinking of places like save the robots on the lower east side (when nobody ventured to the lower east side) that kept things going until it was time to get to the office. it was a special time, one when i learned the golden rule: never stay at the party too long. 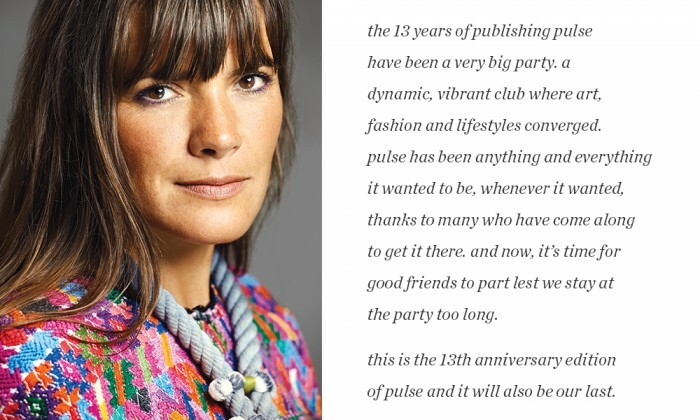 the 13 years of publishing pulse have been a very big party. a dynamic, vibrant club where art, fashion and lifestyles converged. pulse has been anything and everything it wanted to be, whenever it wanted, thanks to many who have come along to get it there. and now, it’s time for good friends to part lest we stay at the party too long. this is the 13th anniversary edition of pulse and it will also be our last. when i launched this publication in 2005, it was in earnest of sending my love letter to long island. in the 136 editions since, we’ve had no shortage of successes and made many friends. i am humbled not just by what we’ve been able to accomplish, but by those who have dedicated their talent, passion, sweat and intelligence to this project. we were blessed by advertisers of all stripes who committed to building their brands with us. readers who kept us on our toes and shared in the party by giving us the fodder to develop our editorial. and of course, the staff and contributors who tirelessly gave their creativity and individual visions to articulating a celebration of the best long island has to offer. 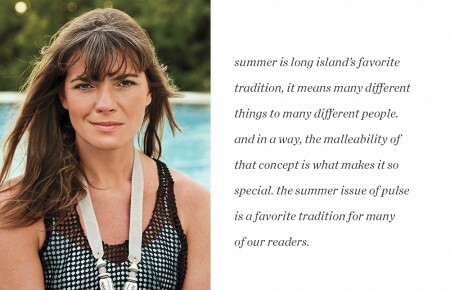 many have tried their hands at the long island magazine game. yet pulse is the only one to have made it this far. not just as an islandwide title, but as one of the largest regional magazines in the country and one of the last standing privately owned independent titles. that has given us a unique podium from which to herald the attributes of those developing their respective iconography and the many things that make this place special. there’s no doubt long island has been very good to me. i’ve learned a tremendous deal from everyone i’ve come to know. but a new island is calling. i have been involved in haiti since the earthquake in 2010. haiti air ambulance is the first and only helicopter emergency medical service in this developing country of 10.5 million people, and i have served this precious organization in some capacity or another since it started. for nearly the last two years, i’ve taken on the challenge of filling the role of executive director, building that program by using many of the experiences i learned here, a connection to aviation that runs in my blood and the sense of community long islanders are so proud of. among the many things i’m grateful for, it’s being able to take these things with me. it’s particularly fitting that this be our final issue of pulse because the arts are front and center. our annual 9 in art returns as the cornerstone, featuring those whose work is influencing the region’s artistic landscape. it’s also me passing the baton—for the first time that byline is not mine, but mary gregory’s. we also go chasing unicorns. robert ross’s feature on old master prints extols the virtues and specialness of printmaking in its earliest forms. and the remainder of our editorial composite casts a light on all the things you won’t want to miss this summer. one in particular would be our summer social on july 15—kind of like our own after-hours, if you will (details on page 25). we hope to see you there to say goodbye and join us in celebrating both the litany of pulse and the future of long island. this event benefits stony brook children’s hospital, where our most precious resources begin, the very stuff pulse has been dedicated to—long island’s next generations of artists, writers, designers, doctors, trendsetters, lawyers, rabble-rousers, teachers, poets and politicians…maybe even a publisher or two.